LOVE BEING A NONNY! : *Double Down to the Beach*...CRAZY Stuff! *Double Down to the Beach*...CRAZY Stuff! If you have read my blog for very long you know hubs is a cyclist. He started riding several years ago. He did his first Century ride (100 miles) three years ago. I did a post about it HERE. He loves the outdoors and does not have a fear of riding on the road. 200 miles in one day. He pedaled a bicycle 204 miles. It took him 12.5 hours. Yeah, I have a hard time driving a CAR for 12.5 hours. Can you even IMAGINE pedaling a bike that long??? 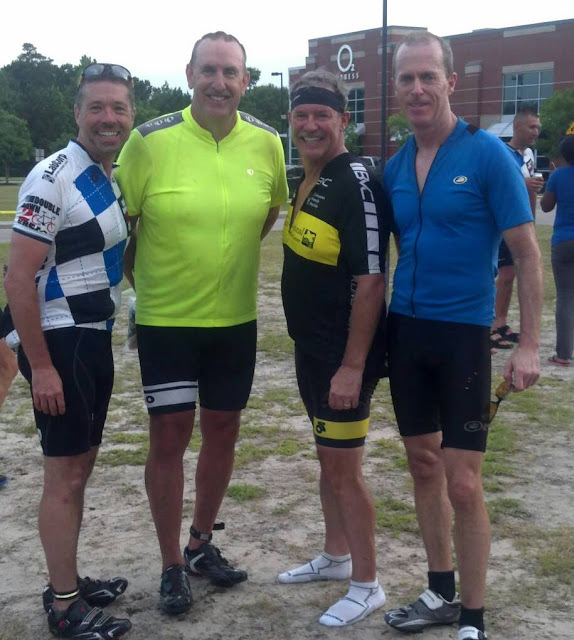 Here he is at the finish with three of his buddies, that also rode over 200 miles. Hubs is in the bright yellow shirt. Give a shout out to these guys! Wow! Impressive. Your grand kids sure are fortunate to have young, healthy, active grandparents! Most impressive! Not many bloggers could share this feat with the world. Congratulations to him! That is something to be proud of! Congrats to him! Hope you are having a great summer! I accidentally commented while signed in under #3's blog. Just disregard that one.